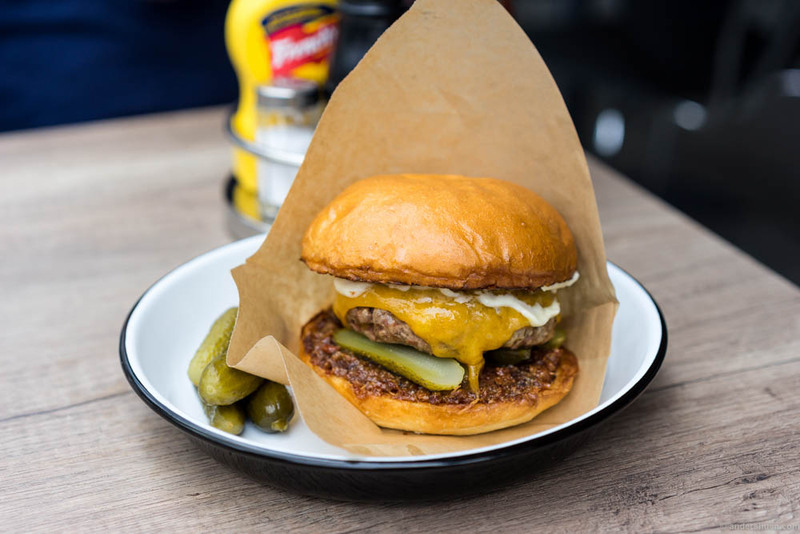 What is the best burger in Oslo? That is an essential question I could not leave unanswered anymore. Burger, as we all know, is the king of food. No one doesn’t like burgers. 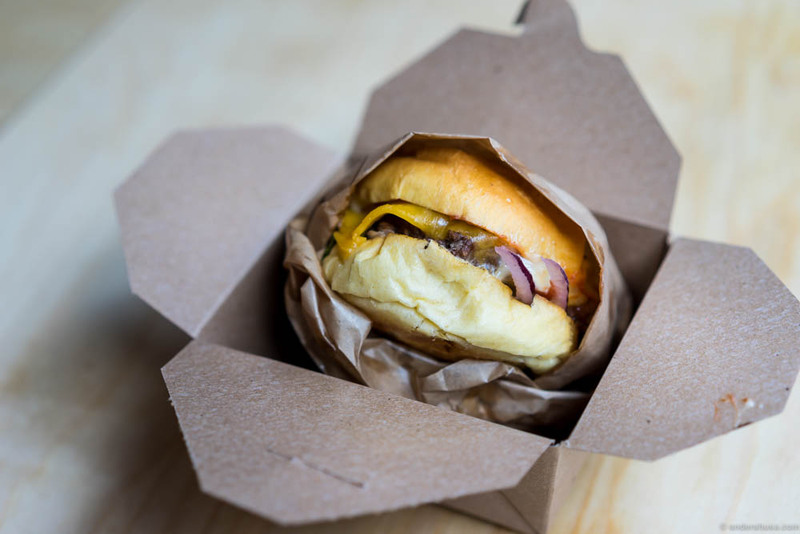 Whether you are rich or poor, a gourmet chef or an average Joe – you still love burgers. Burgers unite mankind. A good friend of mine lives by the philosophy that a burger will always score either a 9 or a perfect 10. It’s either great or amazing, but first and foremost it’s a burger and that’s always good. 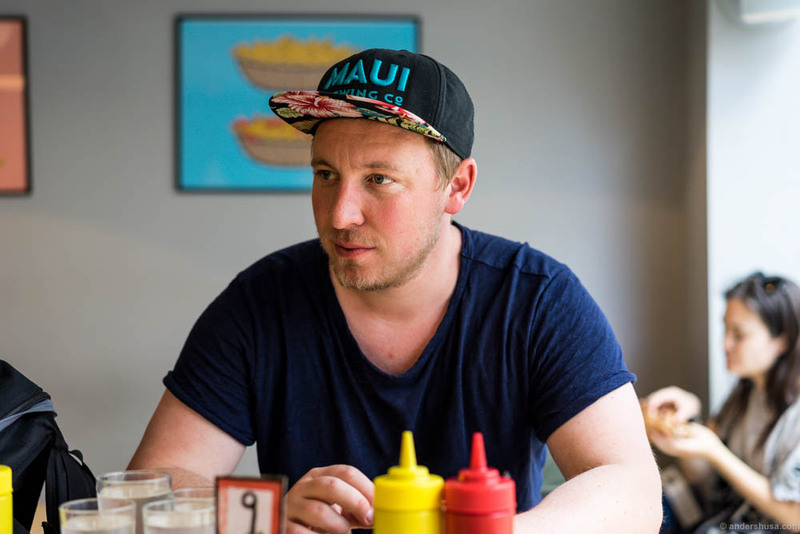 While I see his point, I believe the Oslo burger scene needs a final judgment. Justice had to be made. It was time to find the answer once and for all. Munchies has one of the coolest burger joints for sure. 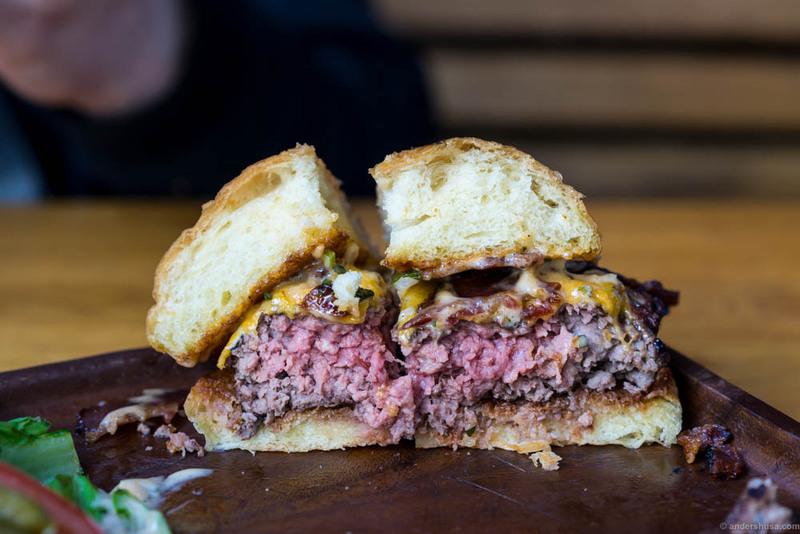 In order to find the best burger in Oslo, I put together the ultimate burger jury. 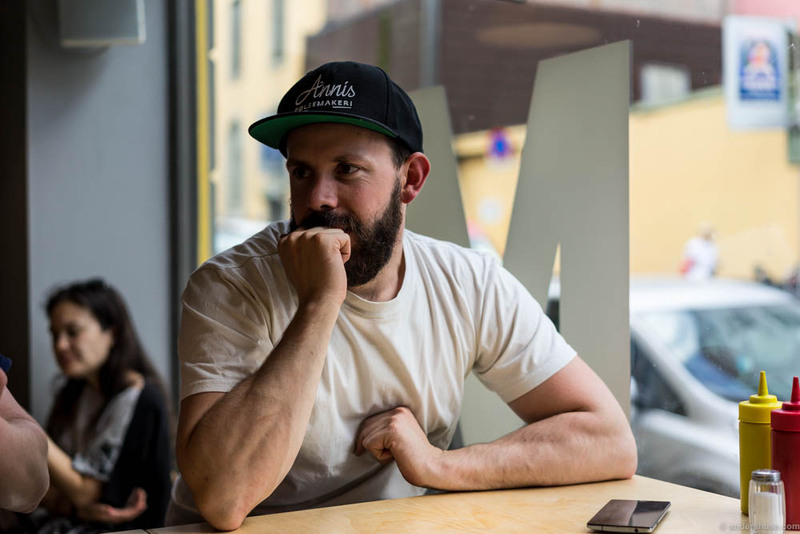 The jury consisted of the Butcher, Daniel Byskov from Anni’s Pølsemakeri, the Beer Lover, André Brandt from Ego Brygghus, the Burger Queen, ByBonjourTristesse, and the Blogger – I guess that’s me. Each one with a unique set of skills. According to old jungle sayings, the butcher can smell bad meat from a mile’s distance. He can also calculate meat to fat ratios merely by looking at the patty. The beer lover, on the other hand, is able to imagine over 9000 possible beer pairings to each burger. Bad jokes aside, the burger queen has actually eaten hundreds of burgers all over the world, in her lifelong quest for the best medium rare cheeseburger. While I can’t quite compete with her numbers, I’ve tasted my fair share – especially in Oslo. Check out the queen’s personal favorites here! The Ultimate Burger Jury. Left to right: the butcher, the burger queen and the beer lover. Behind the camera: me. Google will tell you that many before us have tried to conclude on the topic, but none have previously succeeded to systematically test and score each and every burger of importance in this town. I stress importance, because there are obviously a lot of places serving burger that we didn’t include in our test. Some, because we knew them to be bad, and others that didn’t meet the burger criteria we set. In the process, we were faced with some difficult questions. Should we exclude regular restaurants with burgers on their menu altogether, and only visit the dedicated burger joints? Our first decision was to distinguish instead between burgers that are designed to be eaten by hand, i.e. fast food burgers, and those that requires a knife and a fork. 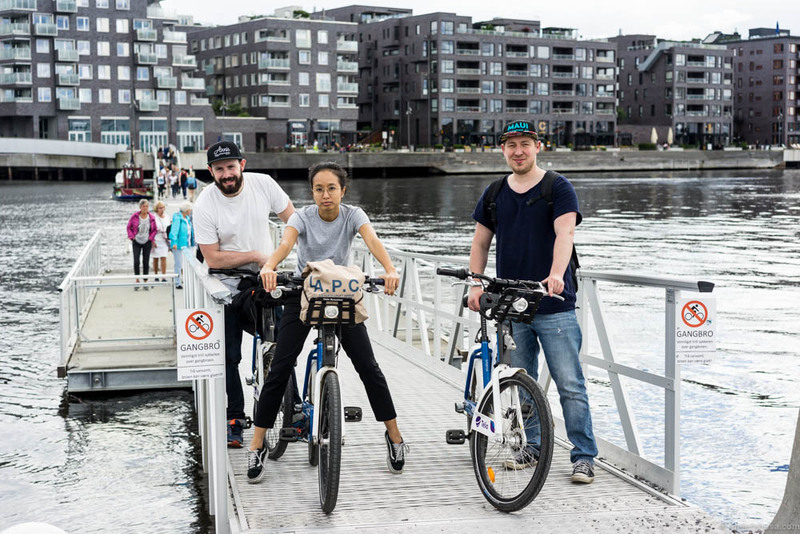 That left us with 15 places in Oslo that we deemed worthy – 12 burger joints, two restaurants, and a pub. 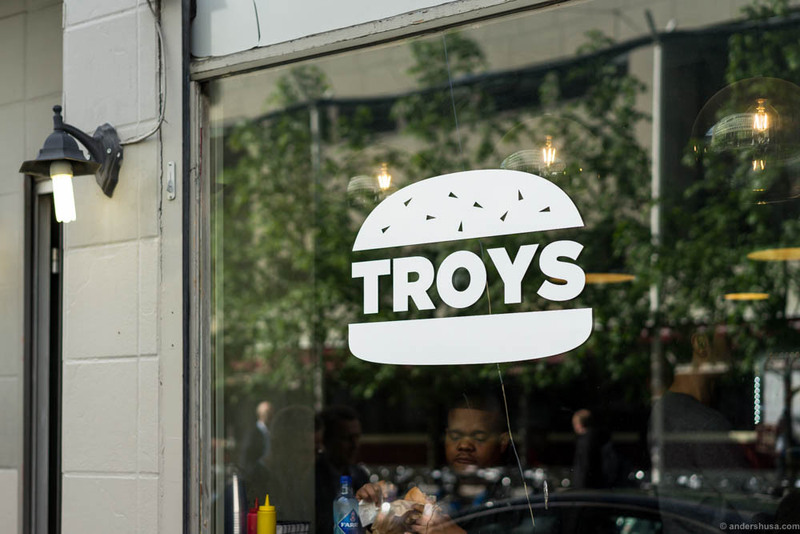 Troys is Oslo’s newest burger bar. Furthermore, should we test all burgers on the menu at each place? That didn’t seem manageable. After all, we had concluded that all burgers had to be tasted during the course of one day in order to accurately score them against each other. The solution was to go for the common denominator, which is, of course, the mother of all burgers – the cheeseburger. Not all restaurants or burger joints used that specific name on the menu, and in those cases, we chose the most similar menu item. That means some cheeseburgers included bacon or caramelized onions, while others had salad, onions, and tomatoes, but at least there weren’t any blue cheese dressings or coleslaw toppings. We figured this to be a better option than asking some restaurants to remove garnish and create off-menu variations. The burger had to be on the menu and designed by the restaurant. The beer lover – he never gets tired of beer and burger. 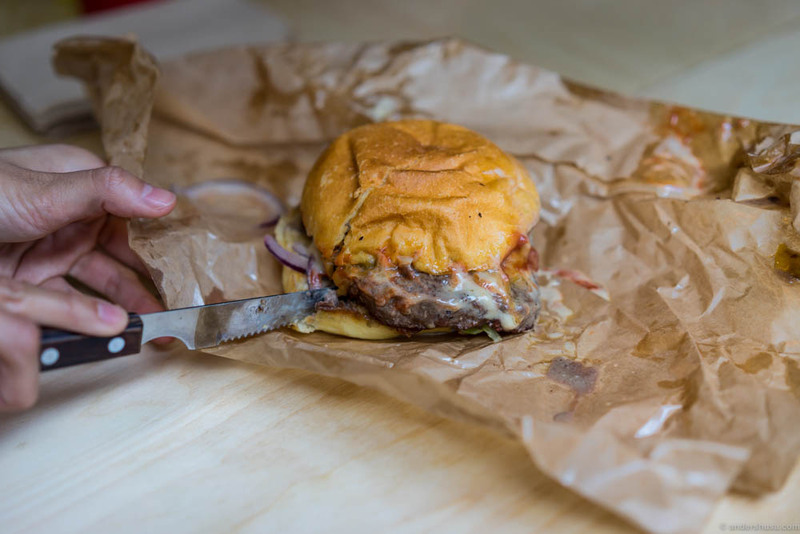 Each burger was paid for, photographed, cut in four with a knife, tasted and judged on the spot. Individual scores and group discussions followed. By the end of the day, all scores were summed up and the groups’ average was calculated with a perfect score being 10. For those interested, I have included a paragraph about the scoring model by the end of this article. Most importantly, though, you have to remember that this isn’t exactly rocket science. Just accept the truth. 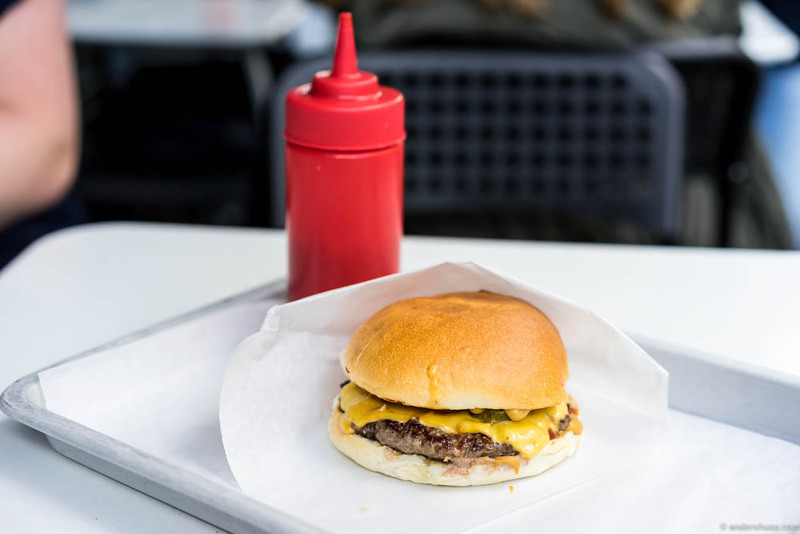 Ladies and gentlemen, I present to you, the list of the best burgers in Oslo! “It’s a perfect 10,” the butcher exclaimed in ecstasy. 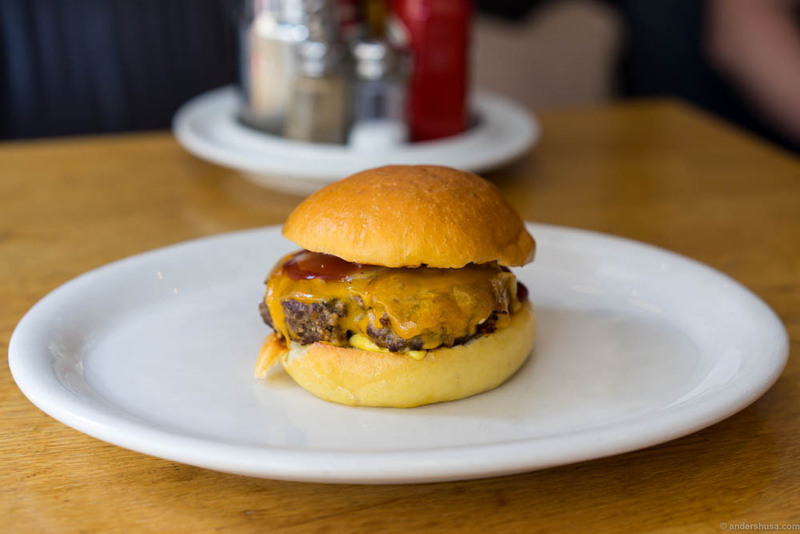 The last burger we tested was the first to get such a clear verdict from anyone in the jury. Who would have thought that a restaurant would beat all the Oslo burger joints? After all, they only got one dish they need to perfect. Not that I’m surprised – St. Lars is the no. 1 meat restaurant in town. They certainly know a thing or two about meat and grilling. 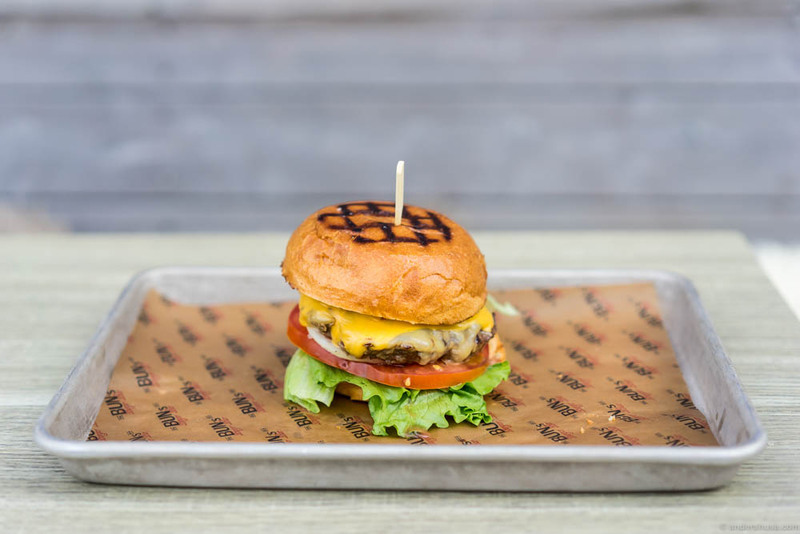 The St. Lars burger consists of a beef patty that is smashed into size and grilled hard on a really warm coal grill. Juicy, dripping, still pink inside, with a caramelized crust and a smoky flavor. A soft, buttery brioche bread, that is just thick enough to soak up the juices and hold everything in place. Incredible crunchy bacon, and just the right amount of sauce. Greens on the side (where they belong!). 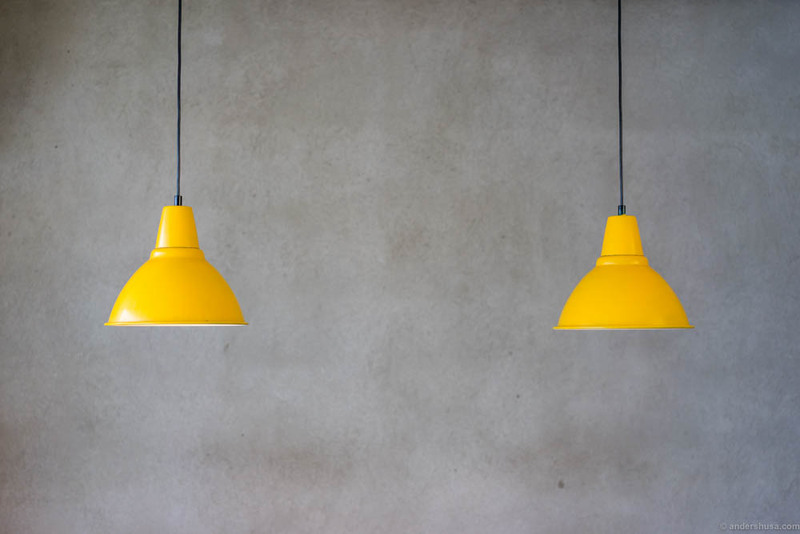 We had only one point of improvement – make the presentation even simpler, more like a burger joint, and less like a steakhouse. 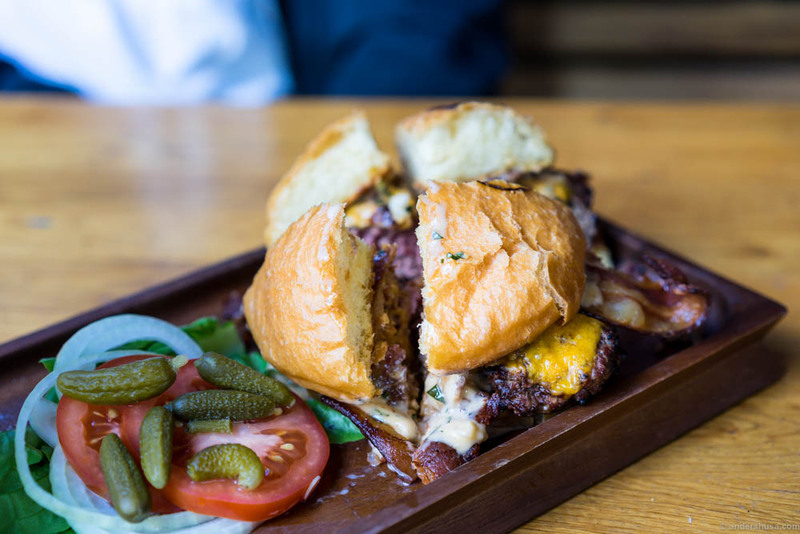 Kick out the Jams at the beer bar Café Fiasco has bacon jam, pickles, cheddar and truffle mayo. Damn, that’s a good burger! Some of the judges rated this equal to the St. Lars burger. 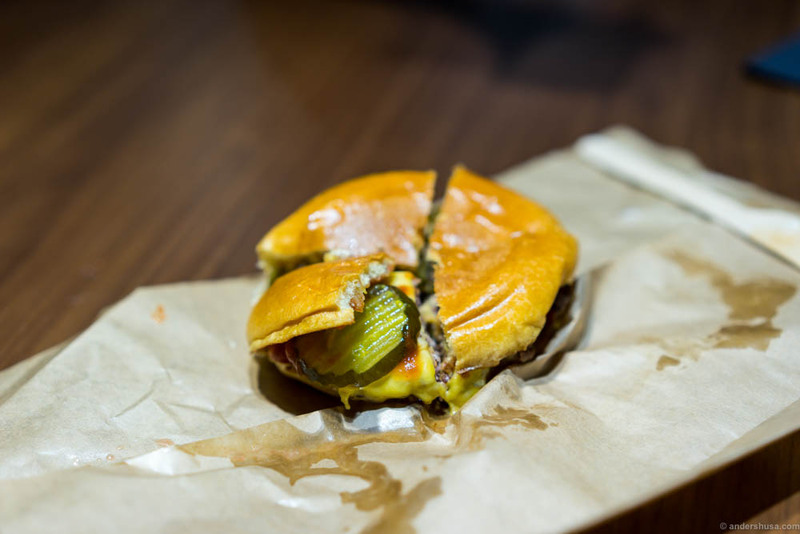 A thick beef patty with a caramelized crust and an extremely juicy inside. The soft bread did its job of soaking up all the fat, but could have been slightly thinner. The burger queen thought it was too fancy with the truffle mayo, but the rest of us were in burger heaven and didn’t notice. 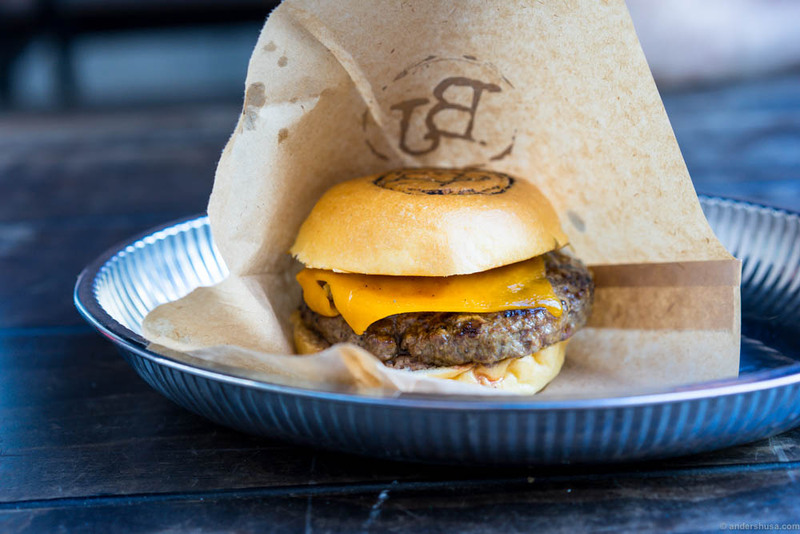 Oslo’s newest burger joint is also one of the best! Troys burger at Troys has cheddar, lettuce, onion, pickles, jalapenos and Troys dressing. It’s the most sloppy looking burger of all we tried, so best to keep it in the grease paper, but damn that’s some juicy deliciousness! A light, squishy brioche bun is clearly made by a good baker. Improve the presentation a bit, and it would be even better, but a clear winner among the burger joints. Bun’s Burger Bar at Sørenga serves their Cheese Burger with cheddar and Monterey Jack, lettuce, tomato, onions, pickles and a house dressing. This is a borderline knife and fork burger! Not very easy to eat with your hands, but the meat is juicy with a good grilled flavor. The toasted, light brioche bread is flavorful and sweet. Sadly, there’s too much tomato and dressing happening, but overall it was rated high. I wasn’t personally a big fan, but clearly, a burger that appealed to the rest. Tangen Cheese at Eckers can be ordered with a single or double patty. We got the double (160 grams) to make it as similar as possible to the other burgers we tried. Philadelphia cream cheese, pickled cucumbers, mustard, ketchup and cheddar cheese. “It’s tastes like an upgraded version of McDonald’s,” the burger queen said, but she doesn’t necessarily mean it in a bad way. “If I compare it to my favorite fast food burger, In-N-Out, it still has a way to go”. Despite the flat beef patties, the meat doesn’t feel dry. 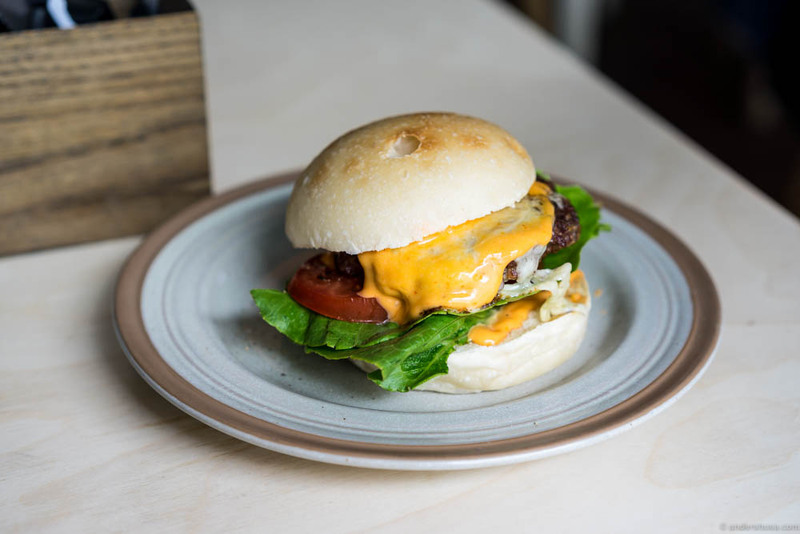 With lots of cheese and a super soft and squishy bun, it just works. “I could easily have eaten another one,” the beer lover said. One of my favorite burger joints in Oslo, Illegal Burger, disappointed me in this round with their Cheese Royale. It has cheddar, tomato, onions, lettuce, pickled cucumbers, Illegal island, ketchup, and mustard. The Josper-grilled meat was tasty as always and quite juicy, but the house thousand island totally dominated the flavor. There’s too much lettuce and tomato going on, and while I kind of like their weird bread, the burger queen can’t stand it. The Classic Cheese Burger at Burger Joint has cheddar cheese, caramelized onions, and a Bloody Mary ketchup. “Pepper! All I can taste is pepper. I love pepper, but this is too much,” the burger queen said and we all had the same tickling sensation on our palate. It’s difficult to eat with your hands as the bun doesn’t manage to hold all the sauce and onions in place. A good flavor from the caramelized onions, but maybe they need to slice them differently so they don’t fall out. The meat is juicy, but the patty is packed a bit too hard. Cheese: not quite melted. 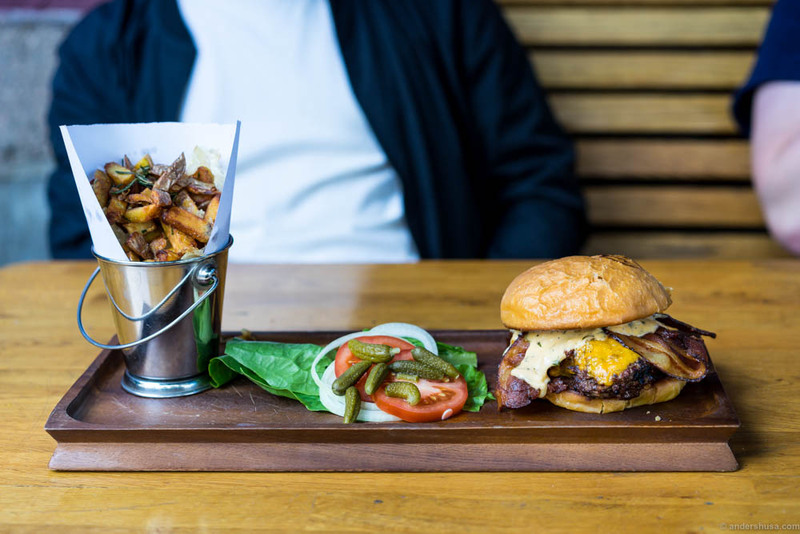 Munchies is an old favorite in Torggata, but their burgers have disappointed several members of the jury in recent years. We tried Cheese with cheddar, ketchup, mustard, and pickles. Plus for a toasted bread with classic sesame seeds, but the meat was a compact puck – not dry, but too dense and hard. Mustard dominated the flavor too much. We tried the Plain Jane at Grill’s Ville, with cheddar cheese, mustard dressing, caramelized onions and BBQ sauce. A decent bun, but the meat was grainy and felt dry. While we loved the caramelized onions, the BBQ sauce was too much. 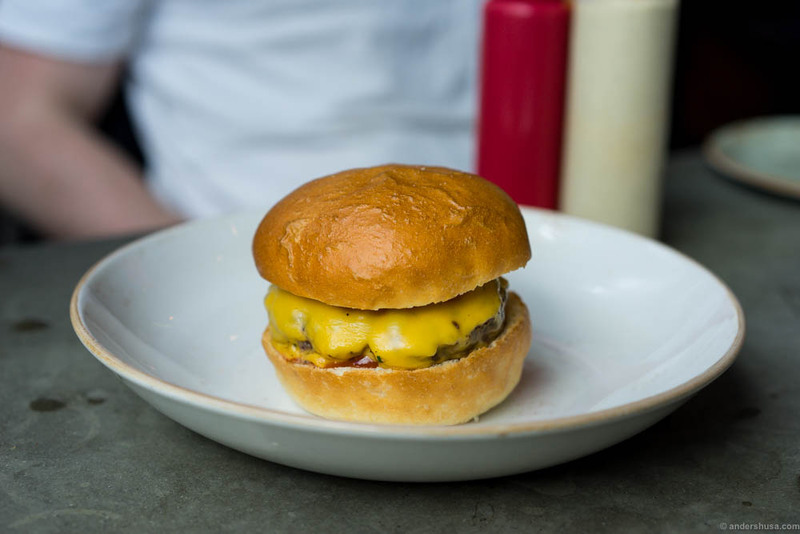 The Cheeseburger at Kverneriet is as simple as it gets with just cheddar cheese, ketchup, and mustard. Sadly, it doesn’t look that good compared to some of my favorites here like Umami and The Boss. This is the naked truth, though, and it disappointed. There’s too much bread, and while it’s airy and light it doesn’t taste much and has a slightly dry mouthfeel. “I wish it would be more brioche-like,” the burger queen said. The meat was nice and pink inside, but could definitely have been juicier. Smalhans had the only sourdough bun in our test. Their Smalhansburger comes with cheddar cheese, tomato, lettuce and chili mayo. Unfortunately, the burger was way too salty, which is sad because the meat was juicy. We were also distracted by the overly large piece of lettuce that stuck out on the side, with a brown, oxidized end. It’s nice with the sting from the chili mayo, but they could have put half the amount of sauce. You sort of want to root for the underdog sourdough bread, but it didn’t work that well, to be honest. What a shame! Døgnvill had the worst presentation of all the burgers we tested. Why would you flip the top bun like that? Their Cheddar & Bacon burger has American cheddar, bacon, tomato, red onions, lettuce, and mayo. Plus for meat that tastes of grill, and bread which is toasted on the inside, but overall the flavor was boring. A dry bun, with too much tomato, onion, and greens, and the bacon dominates the flavor with nothing to balance out the salt. 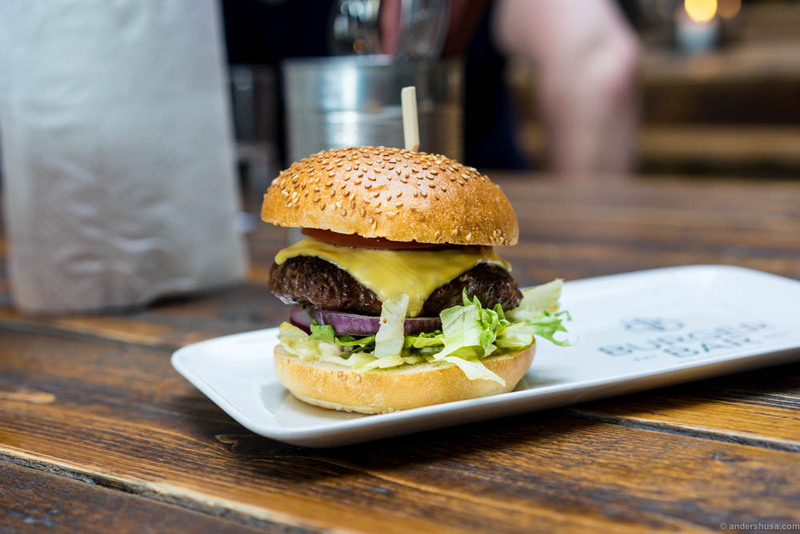 The Icelandic burger chain Tommi’s Burger Joint have established three restaurants in Oslo already. We visited the Torggata venue, and the place was packed. We ordered the Burger with cheese. It tasted of lettuce and ketchup, and the meat was dry. Burger Bar was bad when it opened and sadly hasn’t improved. We had our hopes up, but their Cheeseburger with lettuce, tomato, red onion, aioli and Bloody Mary ketchup is just dull. A flavorless, compact puck of meat in an oversized, dry bread. Tastes of ketchup and onions. No wonder, when you see that huge chunk of red onion at the bottom. Also, not that easy to spot from the picture, but the bread was too big for the beef patty. Each burger could achieve a maximum of 10 points. The presentation either makes you crave the burger or it fails to trigger that sensation. Scores for the patty ranges from dry and hard to juicy and delicious. Buns are fluffy and light, able to hold everything in place, or dry and dull. We also preferred the bread to be slightly toasted on the inside. 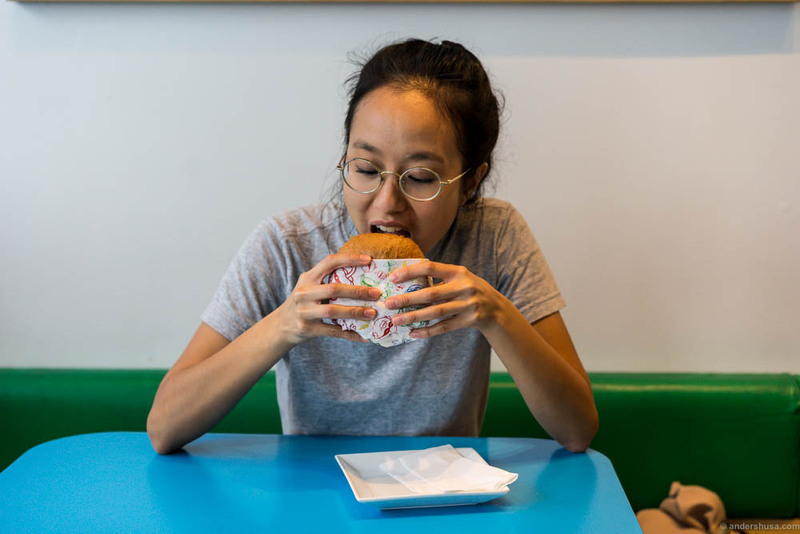 The general score allowed us to judge the overall taste of the burger, and whether each burger fulfilled its goal of being a handheld piece of fast food heaven. This is how you eat a burger. Each member of the jury could choose to alter his or her scores by the end of the day to take into account overly negative or positive evaluations of the first burgers we tasted compared to the last. Surprisingly, though, most scores didn’t change much. The judges were spot on from the first to the last bite. Another surprise, perhaps, is that we never got tired of eating burgers. With a total of 7,5 hours to finish all 15 burgers, and bikes as preferred means of transportation, we managed to keep our burger hunger in check. The butcher is considering whether he should change his scores or keep them. The price wasn’t a criterion we evaluated in this test. It was all about the flavor! However, I did keep track of the prices and can share some fun facts. The cheapest burger in absolute price is Illegal Burger at NOK 86. If you take the amount of meat into account, Grill’s Ville has the cheapest burger at only NOK 53 per 100 grams. 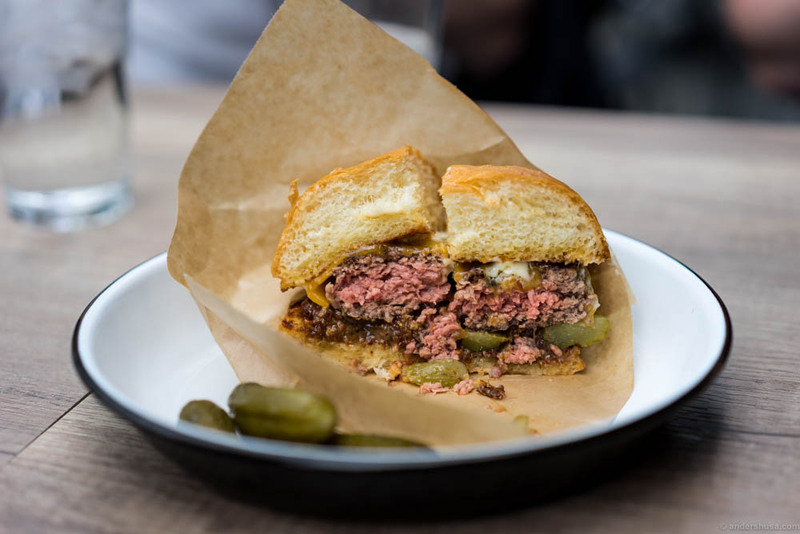 St. Lars has the most expensive burger priced at NOK 239, but it does come with fries included, so the real price is maybe closer to NOK 180 or so. Still, the most expensive, but also the yummiest, so who cares, right? The winner once more. Go try it! Missing a burger on the list or disagree with us? Please leave a comment with your personal favorite. Previous Post Do You Know These Latin American Dishes? Supert med en skikkelig gjennomgang! Må tydeligvis ut og teste noen nye steder. Glitrende blogg forøvrig! 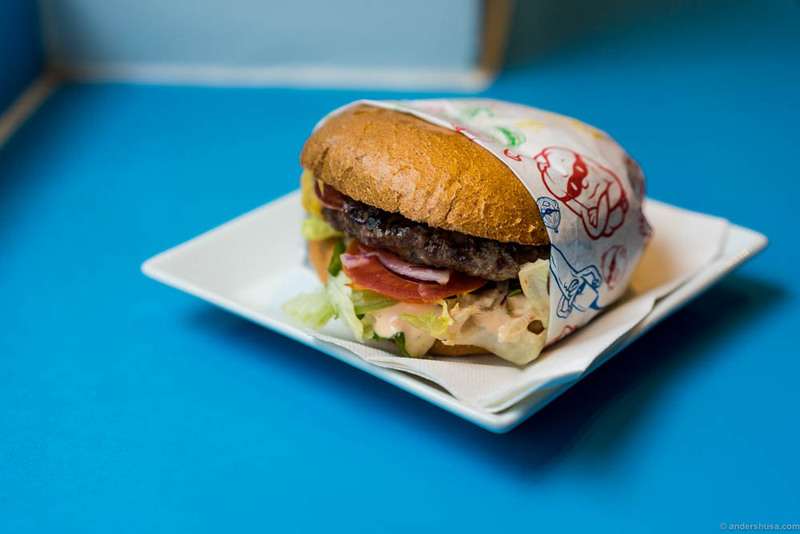 How would you compare the st.lars burger to hekkan burger in Sandnes? And where would you put hekkan burger on this list? Hekkan Burger would probably be high up on the list. Exactly where is difficult to tell. When we tasted all 15 burgers in one day, we were surprised by some of the places that we thought would do much better. The Kverneriet burger balances out much better as a double cheeseburger with two thin patties and double cheese. The single is too dry. Agree on Munchies – what happened with the quality there in the last years? Will have to test the double at Kverneriet once, thanks. Was surprised, because I love some of their other burgers. Nice, can’t wait to try Troys! Yup, tried it. We kept moveable restaurants out of the test since they could be gone the next day. Why didnt you try Opland Burger? Havent tried St.Lars get bit will, agree with alot of what you writing. But i think its wrong to call it the best Burger when you only try cheese burgers! 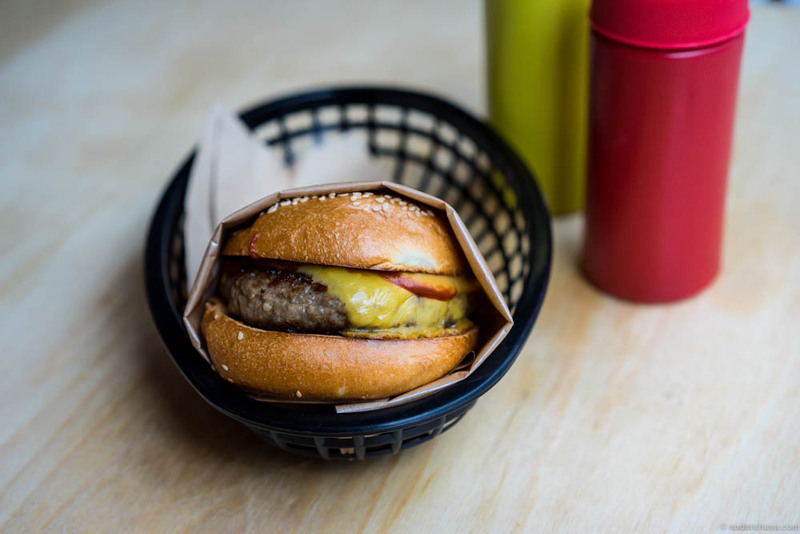 What about do a test and try to find the best burgerplace in Oslo? Probably got lucky at Illegal b. cause they went really down with quality, specially with meat. Before it was one of my favorite places to eat but not any more. And agree on St. Lars also Burger joint got decent burgers. It was indeed very disappointing. Thanks, a good read and an important piece of work, and of course this counts as quality public service! 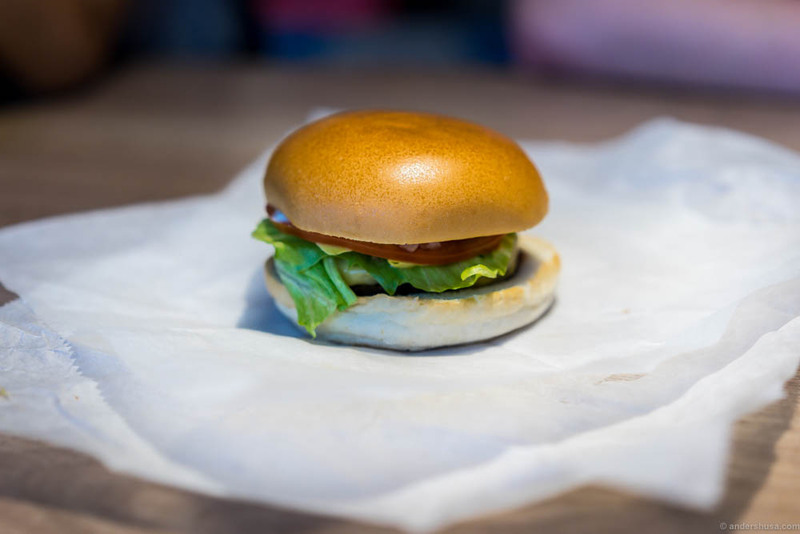 I’d love to see “This is the best vegetarian burger in Oslo” come up on the site later. Also, Trondheim might deserve it’s own posting, they’ve got some good burger game there now with actors like Sot, Bror and Superhero Burgers.